I’m not going to lie. This is the first time I’ve read a book involving a three-some, and BOY was that a REALLY PLEASURABLE EXPERIENCE. 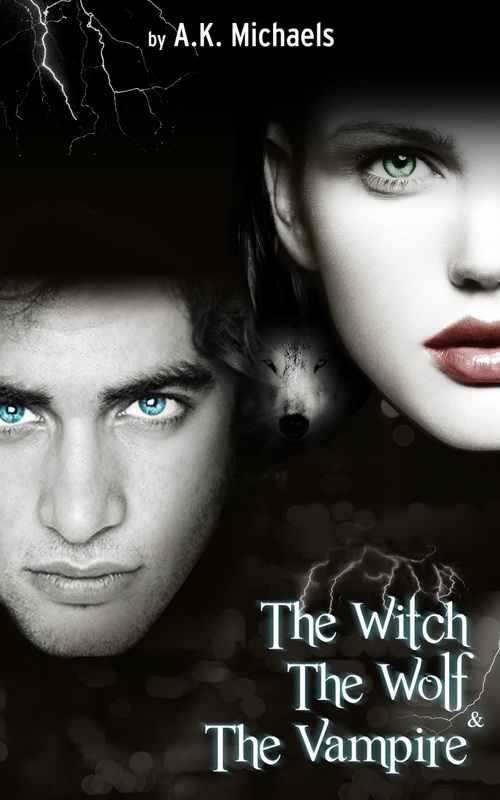 When I first found out there was going to be a witch, a vampire, and a werewolf I pretty much jumped on this book. When I found out the witch was going to end up with BOTH of them I pretty much devoured that novel. It’s just everything I love about the paranormal genre, all meshed into one wonderful story involving magic and romance. Peri has been on the run since she was a teenager. Living in the down-low and doing odd tracking jobs for cash, it seems this time she’s bitten off more than she can chew. After taking quite a beating she stumbles upon an unlikely pair. Josef, a Vampire, and Gabe a Wolf have been together over a hundred years. They share everything together, including women. When they stumble upon Peri both feel this odd and overwhelming desire to protect her, and to be with her. Both vampire and werewolf choose to adopt the young witch, giving her everything she could ever want and more while trying to uncover the secrets of her past. What is Peri running from? And how is she going to take being with both of them? First, there was a lot I loved about this book and a lot that could have been improved on. Keeping in mind the copy I received for review was an early draft that hadn’t been looked over by an editor. I LOVED the romance, I loved the characters and I loved the story. What I thought could have used some work was some in-depth description and plot pace. Now, I’ve seen several reviews have touched upon the poor grammar and editing of this book and after a conversation with the author I’ve found a lot of it has to do with the fact that the early copies that were sent out hadn’t been reviewed by an editor. What I found was that Peri, Josef and Gabe like to reference each other in conversation a lot using their proper name. For example “Okay Josef, but I’m still unsure why you’re doing all this for me?” or “If I’m honest Peri, I am not a hundred percent sure…” To me this sounded odd, referencing the person you’re speaking to in direct conversation. But she advised me that where she comes from this is a standard form of conversation. Another thing I noticed was that there was an odd use of contractions. In some places she would use them, and others she didn’t. Ex: using “did not, could not, would not” instead of “didn’t, couldn’t wouldn’t”. Again, the author advised me that this is mostly for when Josef is speaking. Being an ancient vampire he likes to speak very formally which is why he doesn’t use contractions, but every so often he finds himself speaking quickly, catches himself, and changes back. It just goes to show that some authors have reasons for the way they write, even if it sounds awkward when reading. The characters were very easy to love and get attached to. Even our heroine Peri, a feisty witch who’s been on the road and all alone for years gets my sympathy vote after you find out what she’s been through. The Vampire, Josef, is an old, very attractive, very CAPABLE and rich vampire who reminds me of your typical billionaire, strong, silent, but caring type. His partner in crime, the Wolf, Gabriel or Gabe is the typical comic relief kind of character. He’s warm, easily approachable, sort of like everyone’s big brother, and the one you’d be more comfortable cuddling with out of the two. They two balance each other out while somehow not having killed each other over the hundred years they’ve known another. I think what was hardest for me was the story was heavily dialogue based and the plot was evenly toned, at least until the end. I had a hard time picturing what Peri, Josef, and Gabe looked like and never really got a clear picture. Because the book is so heavy on dialogue and character interaction there isn’t much in depth description; perhaps not as much insight on what the character is thinking or feeling as what I’m used to. The plot is also very evenly toned, very steadily paced from the get go. Peri gets saved by the vampire and wolf and her life becomes infinitely better, physically and sexually as well. Everything just comes so easily to all of them. What I got out of this book is that it’s a fantasy. Who WOULDN’T want to be in a loving relationship with a vampire and a wolf/werewolf. That’s like…an IMMEDIATE turn on for someone who adores paranormal fiction. Both Josef and Gabe are so loving, and caring, they wait on her hand and foot, make sure she’s happy, well-fed, they provide for her, and they pleasure her. I don’t see how there’s a downside to that. “Gave kissed you and so did I, and I must say it was the most gorgeous kiss I’ve ever had. The question is – your first time – you need to decide if it will be one of us? If so, which one or both?” Josef looked to Gabe as the Wolf hissed through his teeth. Josef could feel the arousal running through his friend’s body. The story has a lot of potential and builds up a lot towards the end. A lot of mysteries are going to be uncovered as well as Peri’s relationship with Gabe and Josef is going to go one step further…I definitely recommend this book to anyone who’s into paranormal romance, especially with vampires and werewolves. Ladies, if you’re into a sensual, steamy romance with not one, BUT TWO paranormal creatures this is definitely the book for you.